Running a business can be extremely challenging – there are so many things that require attention. A store needs to look presentable no matter how many people come through, restaurants need all of their tables set, and you may even find yourself washing windows and cleaning toilets in the pursuit of making your business as attractive as it can be to your customer. It’s great to have high standards, but none of these things will help customers find you. You may have advertisements in newspapers and plastered on billboards, but are you reaching the right audience with your marketing dollars? In 2016, a business without a website is almost invisible, and even those with websites can find it difficult to attract the attention of customers. How can you make sure that people can find your website, which you’ve put so much time and effort into? Unfortunately, many businesses think that merely having a brochureware website – a series of static pages advertising their presence – is enough. If you want to maintain good visibility for prospective customers, this simply isn’t the case. You may not have the time to focus on growing your digital presence, but if there were a way for you to experience a 13x increase in ROI and a significant improvement in your ability to acquire more customers, wouldn’t you want to learn more about it? Blogs aren’t only the domain of journalists and the entertainment world – business blogging has become an extremely important marketing tool. Blogging can take up a lot of time, with a consistent schedule needed for the best result, but it’s hard to argue against the benefits that a blog can bring to your website. Search Engine Optimization (SEO) is the process you undergo to make your website as findable by search engines as possible. Good SEO means higher ranking for your related search terms. Blogging significantly improves your SEO in a number of ways – not only does it show search engines that your website is active and is being updated with new content, it also gives them more pages to search through, thus organically increasing your ranking. A higher ranking means that your website will appear higher in search results, causing more people to click over and check out what you have to offer. People Are Visiting My Website. Now What? Since people can more easily find your website, there is a natural uptick in the amount of leads and salesthat you may receive versus is you weren’t blogging. While not everyone who visits your blog will convert to a paying customer, it also allows you to better establish authority and cement yourself as a thought leader within your industry. Through blogging, you also create shareable content that can act as the heart of your content marketing strategy; rather than having to create something completely new every time, you now have a repository of things to share on social media and in emails and newsletters. If you aim for evergreen content – content that isn’t time sensitive – your blog posts will give you long-term results. A post you spend an hour or two writing may translate to a dozen customers over the span of a year. There is always someone who hasn’t seen the content that you’ve written, so don’t be afraid to redistribute older articles that are relevant. Many times, an older blog piece has been able to experience a second life on a new platform months after the fact. 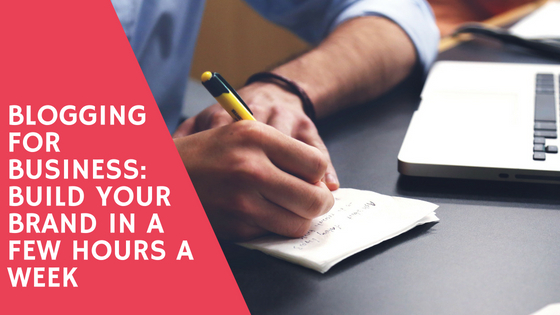 Running a business is a million little tasks, so it may be difficult to put blogging front and centre. However, in the span of just a few hours a week, you can create content that will generate leads and sales, further cement yourself as an industry authority, get insight into your audience, improve your search engine rank, and facilitate discussion among readers.